Our Addix Great American Giveback has come to an end. Last month we launched our national giveback with a goal of getting communities around the country excited about Cause Games in several categories including cancer awareness, military/first responder tribute, the Michael Sadler Foundation, Gilda's Club, and an Open Category. With 20 states involved, we had over 300 nominations with 150 schools being selected to be a part of our Great American Giveback. Addix Gear is an American custom sports apparel and uniform designer and manufacturer. All of the products Addix makes are proudly made in the USA including game jerseys, athletic uniforms, coaching gear, and spirit wear. This social media contest spanned across our Facebook page, Twitter account, and Instagram account with the total votes being the combined number of unique Instagram comments, number of unique Facebook comments, and total Twitter votes for their school each round. After 3 incredibly competitive rounds we are very excited to announce our winners across our five categories. Each school will be receiving up to 50 jerseys for their cause event. Winning schools came from North Carolina, Florida, Arizona, Michigan, and Ohio. The Trinity Bulldogs out of North Carolina are this year's Open Category champions! Trinity had over 2,000 votes in all three rounds. 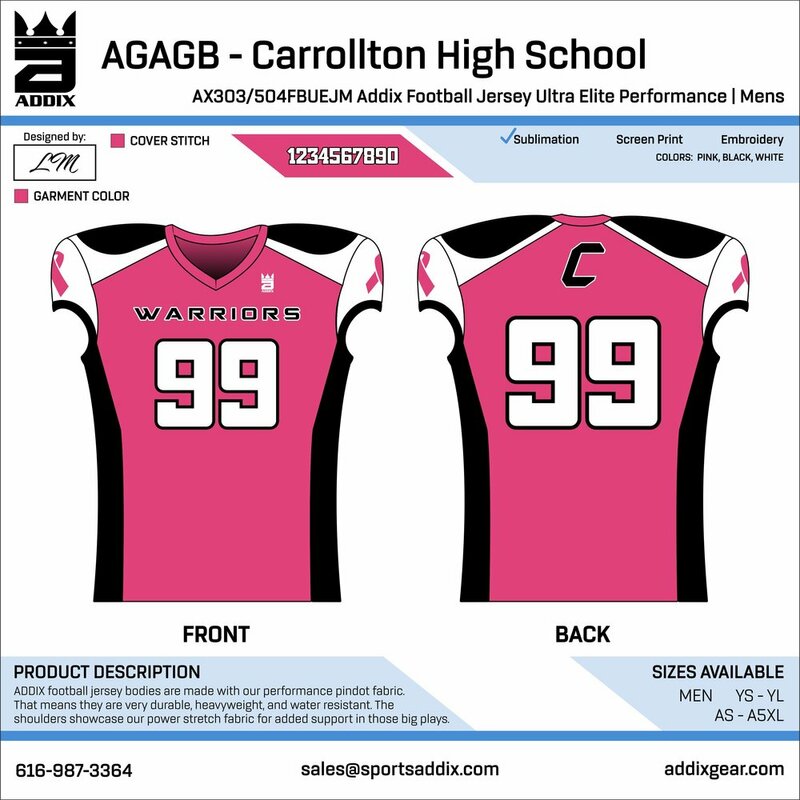 Here is Trinity's cause game description: This will be a football jersey. We will be dedicating this Jersey to one of our players named Tyler Bova, who is a defensive back and receiver for our Trinity High School Football team. As of last week Tyler lost his Father, Mother, and 11 year old brother in a car accident while on vacation. At the moment Tyler is in critical condition and is fighting for his life. We are praying and believing that Tyler is going to pull through. Tyler was originally given a 20 percent chance to live and each day that goes by he is defying the odds. He has had multiple surgeries and is continuing to fight and recover. This is not shocking to any of his family, coaches, or friends because he has always had a tremendous amount of fight. Tyler embodies everything good about a high school athlete. His work ethic and determination to get better is second to none. He is a coaches dream and does all of the little things right. His attitude, intensity, and effort is contagious and he leads by example. He gives every area of his life 100 percent. We would love to be able to honor Tyler with these new jerseys and reveal the jerseys at a fundraiser game to help Tyler's family with the major expenses coming their way. Our Community has rallied around Tyler in this tough time and it would be very special to be able to dedicate a new team uniform in Tyler's name. Result - Trinity won by 1,903 votes. Both Forest Hills Northern and Sumner Academy had gone back and forth with Forest Hills Northern coming out on top. The Huskies overcame a lot of votes from Sumner Academy on Facebook to get the win by winning the Twitter poll and having more Instagram comments. Forest Hills Northern Head Football Football Coach Matthew Moffett told us "We are thankful for the opportunity to have our Mike Sadler Foundation football game on September 28th with the help of Sports Addix. Addix has done an amazing job helping promote community and school sports through various events and we’re very glad we get an opportunity to be a part of this. Our entire community would like to thank Addix for their help in our event! " Here was Forest Hills Northern's cause game description: This is the high school that Michael Sadler graduated from. My son Joshua Wierenga is a Senior on the football team and was Michael's ball boy when he kicked for FHN. Joshua also attended games with his mother Karen at MSU and Michael always made time for Josh. Michael was an inspiration not only to my son but many others at FHN. Michael's academic and athletic ability were amazing but his character, humor and love of life were truly amazing. He will forever be remembered at FHN. We want to honor him and the foundation that his mother is so passionate about. Result - Forest Hills Northern won by 418 votes. In one of our most competitive categories, it was Carrollton High School in Ohio who came out on top. After grabbing an early lead, Carrollton was trailing Hudsonville High School in Michigan by less than 100 votes with under 24 hours to go. Hudsonville had an incredible amount of Instagram votes, but it was the Facebook votes from Carrollton that pushed them over the edge. A huge late push by Carrollton gave them the victory by over 400 votes thanks to those Facebook comments as well as a win in the Twitter poll. Result - Carrollton won by 466 votes. The Snowflake Lobos have been crowned our champions of the Military/First Responder Appreciation Category after 2,189 votes in the final round. The Lobos beat out 2nd-place Montrose by 212 votes. They also beat 3rd place Mason and 4th place Salesian. This was an incredibly competitive category and we tip our hat off to all four schools. Snowflake had a lot of unique Instagram comments which gave them the edge. - This was a video made by one of the Lobo player’s parents. - This is a video of how the Lobo Football team takes the field at the “Heroes Game”. - This is a video of the Halftime activities with our Choir group (Madrigals) singing as other SHS students wave a giant American Flag on the football field. - This is a video of the Post Game Retiring of the Flag with a community member playing “Taps” with his trumpet. Result - Snowflake won by 212 votes. After the conclusion of the voting at 2:00AM EST on August 2nd, the counting began in our categories. Two schools, Fruitport High School (MI) and Leto High School (FL), had separated themselves from the competition. The two schools however could not be separated from each other. After eliminating duplicate votes, eliminating votes from those who did not follow our social media pages, and counting up all of the good votes the two schools were separated 7 votes. We went to thoroughly recount every one of the votes confirming the fact that both schools were within 7 votes of each other. It was determined with such a fine margin (.003%), we would award both schools. Here is Leto's cause game description: Our cause game is for cancer awareness. In conjunction with this we also want to raise awareness for the losses people suffer due to cancer. I always ask my players if they know anyone who has ever been affected by cancer and every time all my kids raise their hands. People suffer losses to this dreadful disease more than normal and it is ok for people to have certain emotions toward it. I lost my father to brain cancer when I was 10 years old. I am currently 29 and it still hurts to this day. To have a group like Gilda’s Club where people do not have to grieve alone, is truly important. The goal of this awareness game is to let people know that it is ok to not be ok and that there is someone here for you always. Here is Fruitport's cause game description: Fruitport runs a Trojan Strong game which will raise awareness for Gilda's Club and those fighting cancer. Result - Fruitport and Leto Within .003%, both won by 372 votes.